On a weekly basis I have one of those meetings that completely and utterly drains you. Remaining switched on conjures memories of trying desperately not to fall asleep up the back of the lecture theatre following a last minute Sunday session the previous day. All of your energy stores are empty. Your glucose is nonexistent, and the only way to fix the situation is with a serious sugar hit. 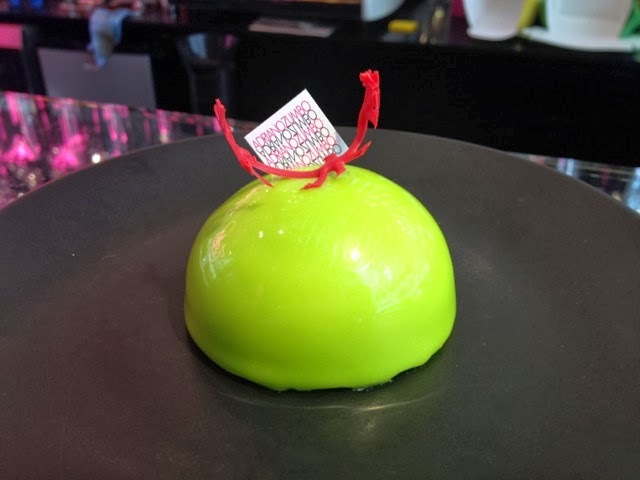 Earlier this week, my saving grace came in the form of a visit to Zumbo Patisserie in South Yarra. Zumbo rose to fame in Sydney following numerous Masterchef appearances by now celebrity chef and owner, Adriano Zumbo. The Melbourne store opened last month to an unnecessary amount of hype. We rocked up just before midday, and given that punters had queued from 5am to get their hands on a cronut or two on opening day, it was hardly surprising to see people lining up for sweet treats before lunchtime. Upon entering, we were intrigued to find a glitzy space with a nightclub feel. Aside from some pink benches, bulbous with foam coated in plastic in an attempt to look like globs of cake batter and icing, or something similarly Wonka-esque, there are only two tables. Both are outside, and outside is not somewhere you ever want to be in Claremont Street (unless of course you have an urge to come down with a cold, ruin your hair from gale force winds or show the world your underwear when wearing a skirt). I found the garish décor detracted from dessert – it was only after gawking at the glowing neon ‘Zumbo’ sign and mirrored walls and ceiling that I noticed the sweets. 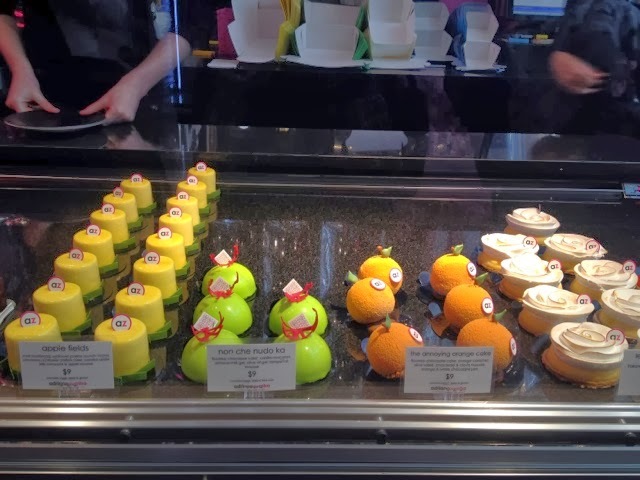 Zumbo is not designed to be comfortable; it's a business model designed to get people in the front door, to the front counter, at the cash register, and then out again. On that particular day, I was in no mood to rush. 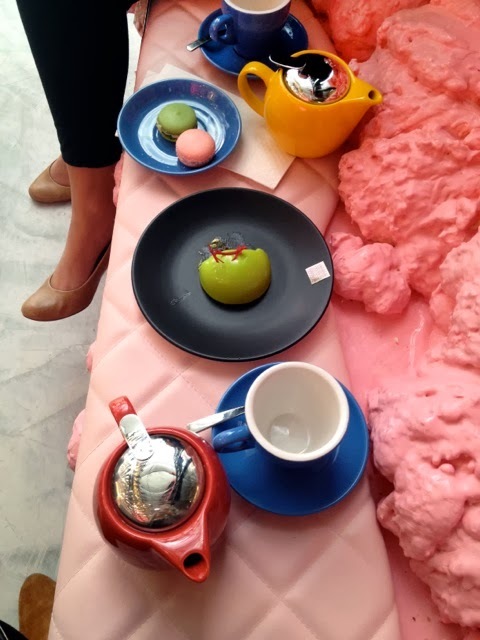 We parked ourselves on a fairy floss bench seat and placed our loot in a line, sans table, once we had ordered. 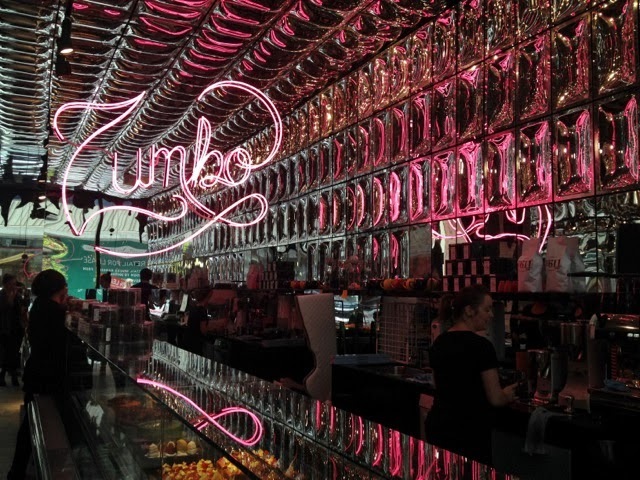 Ordering is no easy feat at Zumbo. You have to stand on tiptoes and glimpse through the gaps between people and above prams if you want to see the display. The counter is divided into a few sections. The far left features smallish cakes that range from $25 to $29. The peanut butter and capsicum option had me simultaneously curious and disgusted. I skipped over to the $9 individual cakes. Deciding which to choose was tricky in a ‘kid-in-a-candy-store’ kind of way. 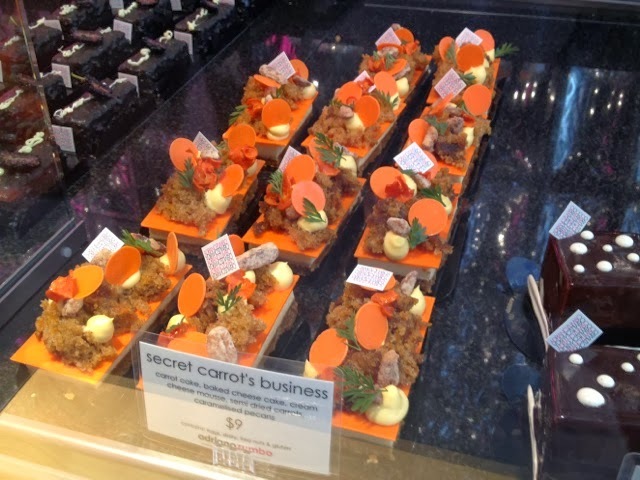 The carrot/cheesecake concoction complete with a secret garden on top, and the endearingly named Annoying Orange Cake, dragged out my decision. I eventually settled on a squat, yellow cylinder dubbed ‘Apple Fields’. 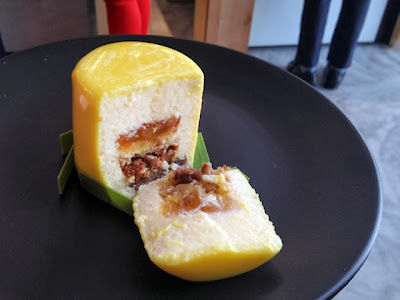 It was the promise of malt shortbread, sunflower praline crunch, honey carameux, sunflower chiffon cake, toasted apple jelly compote and apple mousse that hooked me. I didn’t want to like something that looked so manufactured, but it was bloody good. 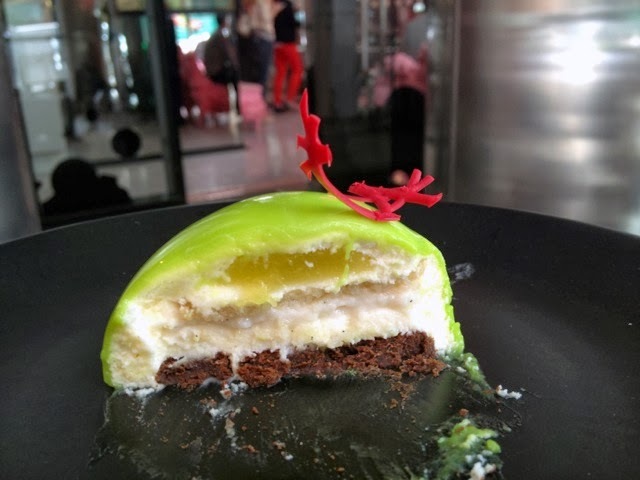 The mousse was light and airy with layers of ingredients hidden within: chunks of apple, a nutty crunch and a biscuit base to hold it all together. But a sugar fix is not a sugar fix without some form of chocolate. 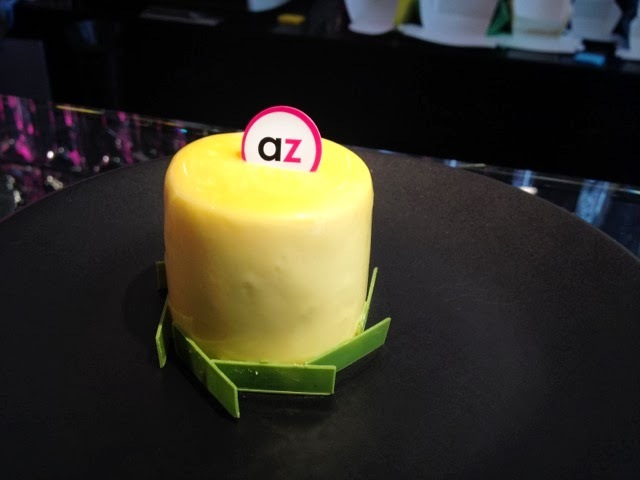 At Zumbo it was the Non Che Nudo Ka flourless chocolate cake, encased in a flawless green dome with silky vanilla macaron mix, almond milk gel, earthy olive oil gel and some tang courtesy of Bergamot mousse. It was more impressive than Apple Fields, but not as enjoyable. We also ordered a ‘Zumbaron’ each, just in case we didn't have enough sugar on our hands already. The finger bun macaron brought back memories of handing over a $2 coin in exchange for my favourite after-school treat at Bakers’ Delight. Initially there was the subtle taste of doughy cake batter, followed by a nostalgic hit of coconut. But it was the pandan and sticky rice macaron that took out first prize, tasting like a tropical Asian holiday complete with sweet, jammy grains of rice. I couldn’t fault the texture or appearance of either. In terms of the desserts themselves, my expectations were exceeded. 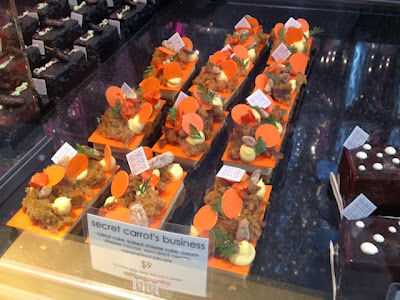 They were much better than when I sampled them in Sydney, although the Melbourne store is a different concept from the dessert train at The Star. As for the space – let's just say I’d recommend getting in and out of there as quickly as possible, and I get the inkling that’s exactly how they want you to feel. 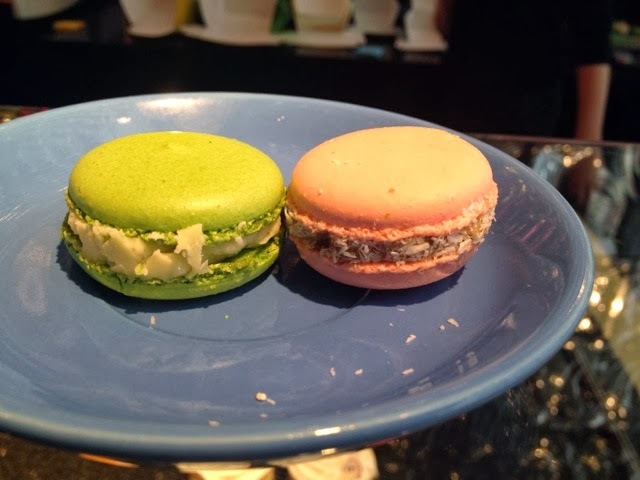 Shockingly, despite the amount of sugar we ingested, neither of us actually felt ill. No one can deny that the deserts are expertly crafted – light and fluffy without being overly sweet – or maybe my sugar levels really were that low after that meeting. But would I return? For sure. If I needed a takeaway treat and there was a car park within 100 meters. You will have a field day here!